Sikhs are one of the biggest victims of physical assaults related to Islamophobia since 9/11. The following are details about an attack against a Sikh resident of Chicago on September 8, 2015. 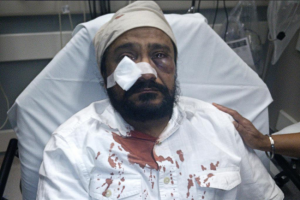 Mr. Mukker, a 53-year-old Sikh American and father of two, was viciously beaten in his car after being called racial slurs such as “Bin Laden,” while on his way to the grocery store in the Chicago suburb of Darien on Tuesday, September 8th. After initially not filing hate crime charges on Friday, the Sikh Coalition met and reviewed evidence with the DuPage County State’s Attorney’s Office on Monday. That meeting catalyzed the decision to file a hate crime charge in the case on Monday. Muslims and Jews in Louisville, Kentucky, plan to join together Friday after several anti-Islamic messages were spray-painted in red on a mosque this week. 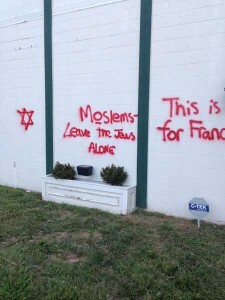 The hate-filled graffiti was first spotted Wednesday at the Louisville Islamic Center, and includes the messages, “Nazis speak Arabic,” “Moslems — leave the Jews alone,” and “This is for France,” a possible reference to the Islamic terrorist attack on a Paris-bound train last month and the massacre at the offices of French satirical magazine Charlie Hebdo in January. Ahmed talked to the media gathered on his front yard and appeared to wear the same NASA T-shirt he had on in a picture taken as he was being arrested. In the image, he looks confused and upset as he’s being led out of school in handcuffs. “Fear and hatred of Muslims was on public display in Spotsylvania County at a meeting concerning the building of a new mosque. At least two men went on racist rants, shouting down the speaker and calling all Muslims terrorists. Some of the people in the meeting were concerned the Mosque would take in refugees from Syria. The main instigator at the meeting continued to shout at Shalaby. “The Council on American Islamic Relations (CAIR), a civil rights organization, said on Monday that it has documented recent “vandalism, threats and hate [incidents]” in Massachusetts, Florida, Texas, Kentucky, Virginia, Nebraska, Tennessee, Ohio and New York, among other states. There was a dramatic increase in Islamophobia attacks against Muslims or people who appear as “Muslim”, in the USA and Canada since Paris attacks. A pregnant Muslim woman was attacked in San Diego and another Muslim mom was kicked and punched when she went to pick her kids at a Toronto school. A mosque was burned in Ontario one day after Paris attack; feces and torn pages of Quran found outside a mosque in Austin; and another mosque was vandalized in Omaha, Nebraska. One man was arrested in Texas for threatening to “shoot up mosque” and another man was arrested for threatening to “firebomb” mosque and shoot children in Florida. “Middle Eastern-looking” passengers were not allowed to board flights in Chicago, Baltimore and Washington D.C. An Uber driver in Charlotte was assaulted and threatened to be killed since he appeared as a “Muslim”. An Egyptian student’s (UConn) dorm room door was vandalized when someone wrote “Killed Paris” under his name. Shots were fired at a Muslim home in Florida. “Every Muslim is a terrorist” was shouted at a town hall meeting in Virginia. “After threats appeared on social media, Burlington police are monitoring the grounds of the Christian church that will soon become a mosque. Chief Jeffrey Smythe confirmed Monday the department was aware of threats made on Facebook to vandalize, damage and desecrate Life’s Journey United Church of Christ’s building and grounds at 1908 S. Mebane St.